Be the first to share your favorite memory, photo or story of Harles. This memorial page is dedicated for family, friends and future generations to celebrate the life of their loved one. 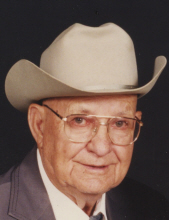 Harles Bud Fletcher, 97, of Elk City, Oklahoma was born on January 13, 1922 in Forty One Community. He is the son of Robert Jackson and Mary Myrtle (Cavasses) Fletcher. He went to walk with his Lord and Savior on Saturday, January 19, 2019 at Elk City Nursing Center in Elk City, Oklahoma surrounded by his loving family. He married his best friend and sweetheart, Naomi Lee Ringo on October 13, 1939 in Burns Flat, Oklahoma. She preceded him in death on June 8, 2013. Bud was a handy man, he enjoyed working on vehicles and mowers, air conditioners and gardening. He enjoyed being busy. Funeral services will be held at 2:00 p.m., Wednesday, January 23, 2019 at the Martin-Dugger Funeral Home Chapel in Elk City, Oklahoma. Rev. Danny Ringer will officiate. Interment will be at Fairlawn Cemetery in Elk City, Oklahoma. Services have been entrusted to the care of Martin-Dugger Funeral Home in Elk City, Oklahoma. Cherishing his memory is his daughter, Norma Jean Brown and her husband, Ronald of Edmond, Oklahoma; two sons, Bobbie Dean Fletcher and his wife, Geneva of Blackwell, Oklahoma, Danny Fletcher and his wife, Theresa of Elk City, Oklahoma; eleven grandchildren; twenty-one great-grandchildren, with one on the way; five great-great grandchildren. He is preceded in death by his wife, Naomi; parents, Robert and Mary; daughter, Dana Beth Fletcher. Memorials can be made to the Alzheimer’s Association and the American Cancer Society in care of Martin-Dugger Funeral Home, P.O. Box 707, Elk City, Oklahoma 73648. To send flowers or a remembrance gift to the family of Harles Bud Fletcher, please visit our Tribute Store. "Email Address" would like to share the life celebration of Harles Bud Fletcher. Click on the "link" to go to share a favorite memory or leave a condolence message for the family.